It is with much pride that I announce that our book The FODMAP Solution is now available in three languages: French, Italian and English. Those suffering from irritable bowel syndrome (IBS) can therefore now find us in several countries. Our journey into the world of books began in January 2016 in Quebec, with the launch of “La solution FODMAP”, by Éditions du Journal de Montréal. It was a huge success and we remained in the top 10 sellers for 12 weeks (we even got to number #2 for a week!). According to our readers’ comments, what was most appreciated was first and foremost the clear and precise way our book explains the FODMAP method. Secondly, the three weeks of menus and 100 low-FODMAP recipes that help to put the method into practice easily. Many readers also praised the daily support they find on our private Facebook Group, which is moderated by a specialized nutritionist. And they all said they take the detachable list showing “YES” foods on one side, and “NO” foods on the other to restaurants or grocery stores. Very practical! It is in part thanks to the success of this book, but mostly in recognition of our leadership in the development of effective solutions to the FODMAP diet, that we won the DUX Prize 2107. An edition adapted to the French-speaking European market (France, Belgium and Switzerland) was published by Thierry Souccar Editions in August 2016. At Expo Manger Santé et Vert, many of our “La Solution FODMAP” readers came to see us. 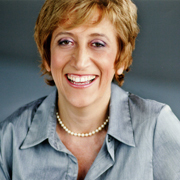 Rénée Charest, among others, who always has her lists of Low-FODMAP foods and High-FODMAP foods. Here she is with Cinzia. In January 2017, the prestigious publishing house Sperling & Kupfer published the Italian edition “La dieta FODMAP” (“The FODMAP Diet”). Here again, we had to adapt the book and recipes to take into account the availability of ingredients in Italy, which is different to those in other markets. Our book received significant media attention and enthusiastic reader reviews. Unsurprising, when we consider certain statistics show that 30% of women and 20% of men in Italy may have IBS. The Italian book’s sub-title – “I cibi “pancia piatta” (“flat-tummy” foods) – is a nod to the obsession for a “flat tummy”, because let’s not forget that the result of a low-FODMAP diet is, among others, precisely to reduce bloating. 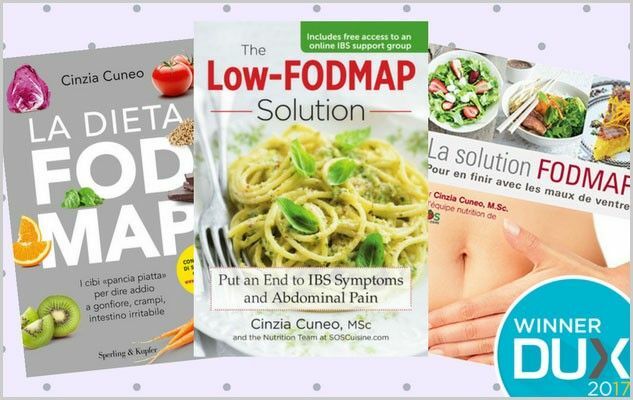 In March 2017, the Toronto-based publishing house Robert Rose published the English edition of the book, entitled “The LOW-FODMAP Solution – Put an End to IBS Symptoms and Abdominal Pain”. This edition includes 4 weeks of meal plans, with one completely vegan, and 130 recipes – including many vegan-friendly options. As with the Italian and French versions, it also includes a detachable list of allowed foods on one side and products to avoid on the other. From the increasing number of new English-speaking members in our private Facebook support group, the English version of our book is well positioned in Canadian and American markets.